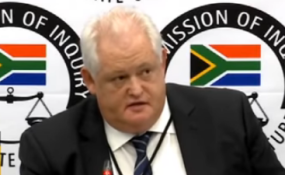 The second day of testimony by former Bosasa top boss Angelo Agrizzi in the commission of inquiry into state capture is set to be far more explosive and damning for the ruling ANC party and his former colleagues. On Wednesday, Agrizzi took the stand, becoming the first witness to give evidence of grand corruption and an extensive network of bribes not linked to the Gupta family, but rather emanating from Krugersdorp-based company Bosasa. Day one saw evidence leader advocate Paul Pretorius walk Agrizzi through the history of Bosasa, and how he had joined the company in 1999. At the time, Bosasa was named Dyambu Holdings - a former ANC Women's League front company which at the time had shareholders that included Baleka Mbete and Nomvula Mokonyane. Mokonyane's name is likely to feature in day two of Agrizzi's evidence. Last year News24 revealed that Bosasa had installed high-end CCTV and security systems at Mokonyane's home, free of charge. The company gave similar gifts to mineral resources minister Gwede Mantashe, deputy minister of justice Thabang Makwetla and heavyweight ANC MP, Vincent Smith. Agrizzi revealed how Bosasa spent between R4m and R6m a month for cash bribes. Among those implicated are union officials and Airports Company of South Africa officials who were allegedly bribed in exchange for a five-year guarding contract. Former South African Post Office (SAPO) CEO Mandla Manyatsi and former SAPO head of security Siviwe Mapisa also allegedly accepted bribes in exchange for Bosasa securing a guarding contract for security at post office branches around the country. Dudu Myeni, close confidante to former president Jacob Zuma and former SAA chairperson was also mentioned - she allegedly showed confidential NPA documents to Agrizzi and Bosasa CEO Gavin Watson during a meeting at the Sheraton Hotel in 2015. Agrizzi gave a candid account of how he was complicit in the schemes to bribe several officials, and did not pull any punches. On more than one occasion he dispelled any doubt when he said: "It was a bribe." It was kept a top secret that Agrizzi would be giving evidence until Wednesday morning, when he arrived at the state capture commission with four bodyguards dogging his every step. During his testimony and under questioning Agrizzi would lean forward to get closer to the mic, and would cast disbelieving looks at Pretorius if he asked a question Agrizzi felt he had already answered. "That's why it's in my affidavit," he quipped at one stage, before quickly apologising. Agrizzi frequently claimed to have little or no memory of certain incidents, but would do a fantastic about turn with other sections and recall in minute detail certain bribes and conversations. Day two, News24 understands, is likely to start off with a telling video clip of Watson, sitting inside his now infamous safe at Bosasa headquarters, counting cash destined to be paid as a bribe. Further revelations may deal with the controversial multi-million rand correctional services tenders, and the former commissioners who accepted bribes to keep Bosasa in the pound seats.